The Abbot is ready to welcome you! Born in May 14, 1958 in Yadè, District of Kara, after my High School and my Baccalauréat, I joined the Monastère of Ascension in Dzogbégan in Togo, a foundation of En-Calcat (France) on October 1, 1978 and professed my simple vows in Dzogbégan on April 26, 1981. Looking for a kind of monastic life which is very simple, closer to the people and more African, I left Dzogbégan in April 1984 and went to Europe for one year of experience in different monasteries and communities. It was a time to find my own African way. When I returned to Togo in June 1985, it was clear for me that I had to follow the voice which called me out from Dzogbégan. 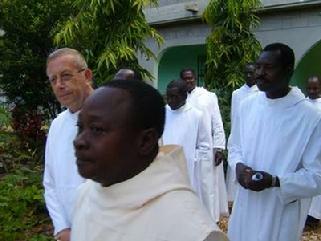 I then returned to my Diocese and Mgr Chrétien Matawo Bakpessi gave me the permission to start a monastic experiment. I founded the Monastery of Incarnation on August 6, 1985. But I needed more theology in order to form the Monastery spiritually. So I took correspondence courses in the Catholic Faculty of theology in Strasbourg (France). After five years I received my ‘Licence en Théologie Catholique’. During these years of studies I was obliged to go every year to Strasbourg for exams. I used these opportunities to beg for help and to look for a Community or Congregation which would allow the Monastery of Incarnation to follow its African way. In 1987, through Abbot Fidelis Ruppert of Münsterschwarzach, I met Archabbot Notker of St. Ottilien and applied to join the Ottilien Congregation. I was happy with the missionary character of that Congregation. In April 1988, Archabbot Notker Wolf and Abbot Fidelis Ruppert came to visit us in Agbang. They were so impressed by our experiment in African monasticism that they invited me to apply to the General Chapter. In October 1988 I went with my Bishop to the General Chapter and they accepted my monastery. After one year of mutual observing I was able to renew my profession in St Ottilien on October 1, 1989. I was ordained on September 21, 1991 in St Ottilien and returned to Agbang in Togo for my finial profession on November 9, 1991. From the beginning till now we have been a fully African community in membership and are happy with the results. Slowly but surely we go ahead and we grow. Actually we are 25 finial professed monks, 3 temporary professed monks and 4 novices. Most of us are Togolese (from four different tribes), one is from Burkina Faso. Our community is a very young one. Apart from Br. François I am the oldest member of the community. This evolution made it possible to be canonically erected as Conventual Priory on August 6, 2004. In August 2010 I asked to resign from my office as Prior and the community elected Fr. Bernard Anaté osb as Prior. I am very grateful that since January 2011 I am the Rector of the International Benedictine Study House in Nairobi, Kenya. On August 6, 2016 our Monastery was raised at the rank of an Abbey. Then we elected the 1rst Abbot: Fr. Abbot Romain Botta osb. We have some shops which produce revenue to support us. But we have to rely mostly on donations because of the poor financial situation of Togo, and because many of our confreres who would otherwise be earning money are still in different stages of formation and studies. We have a dispensary, a school, a small library and do some limited pastoral work. We have only three priests but need more for the great work of evangelisation. In Togo more than 60% of the population are animists. In our area only 10% are Christians. We are very involved in the process of inculturation. It is very important for us that our faith may be rooted in our culture otherwise, like the North Africa in the past, we’ll not be able to resist to the Islamic pressure. My great concern is to get help for formation. My policy is to open worldwide windows for my young confreres to study and experience monasticism in different cultural contexts so that coming back we can build a truly African community enriched by diverse cultures. My great consolation is that till now not one of those I’ve sent abroad was tempted to remain there. They all returned with joy to bring their contribution to this ‘Opus Dei’ in Agbang.